I don't know if these isolated, uncontextualized quotes do anything for you or not, but this quote really speaks to me. The last few weeks I have spent some time studying the man, Dietrich Bonhoeffer, and some of his theological views. He has some very progressive and radical theological thoughts (almost like Jesus) and he courageously lived out these beliefs in God in the shadow of the dark and ominous setting of Nazi Germany. I am inspired by his words and life. The reference to the "suffering of God" in the above quote gets my attention because of a book I just read by Jurgen Moltmann that is titled, The Crucified God. This was an academically challenging book for me to read, but its message and development of the idea that it was God upon the cross, in the midst of ultimate suffering and forsakenness, is one that I cannot easily get away from. The work of the cross and the idea of the suffering God are integral to the living of a daily life of faith. It is in the place of the "daily-ness" of life that theology is realized and it is within the context of the crucified God that the secular aspects of life are rendered sacred. 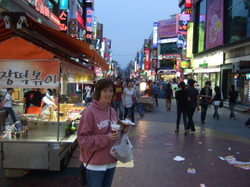 Dina and I went to the downtown area for a while this evening while the girls were at the church youth group meeting. It was dinner time and we were hungry so Dina went to KFC for a chicken wrap and I ate some duk boki from the street vendor in the picture. 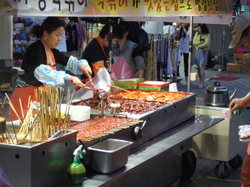 It was a warm evening and a great night to see the sites of Daejeon and to watch people. It was nice to get out of the office and step away from my on-line class for awhile. What a blessing it was to spend some time with my wife and to enjoy the amazing place that we live. Did you look around at your world today? I hope so because there is lots to see. Ever since I started this blogging thing I have been diligently carrying a camera around with me everywhere I go. The reason is because there is so much in this world to see and take pictures of. It is amazing how carrying a small digital camera around in my pocket has caused me to open my eyes up to the astonishing sights of the world around me. Please stay tuned as my goal is to get back to blogging regularly by May 1. I have some blog thoughts percolating and I want to jump back into looking at Oswald Chambers’ thoughts in Run Today’s Race and comment on the Apostle Paul’s words in First Timothy. Just an FYI—even though I have been busy, I have been trying to keep first things first. In life, there are things that are more important than work, on-line classes and even blogging—they are….relationships. Busyness is a cruel joke of the evil one if it comes at the cost of relationships. I am thankful for my relationship with God, my wife, my daughters, my friends and with you. Today was a blustery day in South Korea. The wind blew hard and the rains poured from the sky. 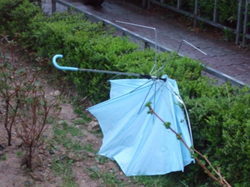 As we were walking back to our apartment after this blustery day we came upon this discarded umbrella. At some point in this day the winds blew, the umbrella buckled and someone got wet. 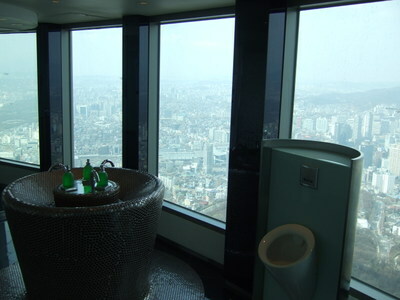 Speaking of getting wet. Our TCIS boys' and girls' soccer teams had home games this afternoon. After today's wind and rain our soccer field was one giant mud hole. Before the boys' game started our soccer coach had all of the boys on the TCIS team lay down on the field and roll in the mud and water. He wanted them to focus on playing soccer rather than staying clean and dry. It worked, we won 3-2! There must be a life lesson in each of these vignettes. Can you find one? Today as an assistant principal wasn’t too much fun. I had to deal with quite a few discipline issues in the office today. This morning I found three students skipping chapel and a teacher found five students skipping chapel. I called them all in and they all took responsibility for their choices and accepted the consequences for their behavior. After it was all over I had to chuckle a bit in disbelief. The reason is because the three students that I found skipping were all in the library with laptops and books open working diligently and the five students that the teacher found were locked into the bathroom stall studying for tests, preparing for projects and typing away on their laptops. When I was in high school and my friends and I skipped a class we…..(no comment, my mother reads this blog). Needless to say, we were not working on homework. I love the students that I work with. 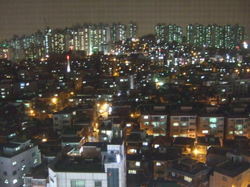 This is a picture I took from my 12th floor room in the Stay 7 Hotel on a rainy night in Seoul, South Korea. This picture is only one little snapshot of this enormous city. It is amazing to think that each light in each window probably represents at least one or two people. It is even more amazing to think that each of those people have hopes, dreams, struggles, joys, sorrows, desires, goals and lives…just like me. I like this quote by Chesterton because I like mystery as it relates to God, and I like to think of myself as an ordinary man. Lately, in a class I am taking, I find myself reading a book that I don’t think this ordinary man would read unless it was required reading for a class. It is Church Dogmatics by Karl Barth. This is a very heady theological book that I am surprisingly finding quite inspirational. I won’t go so far to say that I am understanding all (or most) of what I am reading, but I will say that I am moving out of the dark and into the twilight. Some of the light that I am seeing is emanating from the wonderful and mysterious concepts of Sacrament, Incarnation and most importantly, Jesus Christ. 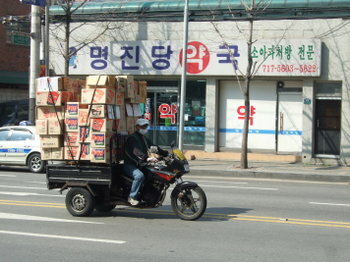 Throughout the year here at our school in Daejeon, South Korea our high school student council has been involved in enacting RAKs (Random Acts of Kindness) upon our student body as a means of servant leadership and to model and encourage a sense of care and community within and amongst the student body. Some of the RAKs over the year have included things like handing out ice cream treats at lunch time, free hugs, and the offering of after school tutoring sessions. This month the student council decided that the RAK would be foot washing. Yes, you read it correctly—foot washing. Our high school is a Christian School however, it is important to remember that at least half of our students are not Christian believers. The student council chose foot washing as the April RAK activity. Today was the day of the foot washing activity. During the long morning break the student council leaders set up a foot washing station in the school multi-purpose room. As I walked down the stairs and through the hallway to observe the activity I came upon student council leaders transporting basins of warm water from the restrooms to the multi-purpose room. They were filling the basins with water to wash the feet of their peers. As I entered the multi-purpose room the lights were off and the room was dark except for the illumined glow of candles throughout the room. 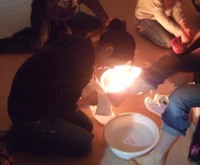 By candlelight I could see students kneeling before their peers, washing their feet in basins of water. There was a quiet peacefulness in the room. 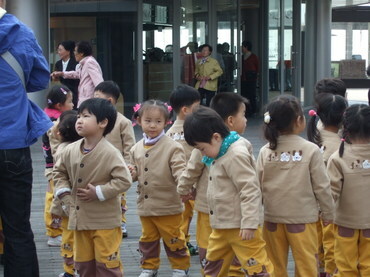 Some of the students were talking softly with one another as the one washed the other’s feet and some were silent. Over the years, I have observed and taken part in many foot washing activities in worship services and at church camps, but never have I seen or experienced a foot washing like I did today. In the middle of a very normal and busy school day, our student leaders knelt and humbly washed the feet of their peers. It was beautiful. “Jesus knew that the Father had put all things under his power, and that he had come from God and was returning to God; so he got up from the meal, took off his outer clothing, and wrapped a towel around his waist. After that, he poured water into a basin and began to wash his disciples' feet, drying them with the towel that was wrapped around him.